The Durban ICC was originally built as a catalyst for economic development for the City of Durban and the KwaZulu-Natal province. This primary mandate was expanded in recent years to include profitability as a self-sustaining entity of the eThekwini Municipality. Having completed its 18th year of successful operation, it is clear that the Centre is performing admirably on both of its twin mandates. An independent Economic Impact study has been commissioned annually since 2007 to assess the extent of the Durban ICC’s socio-economic benefit to the City, Province and Country. Grant Thornton South Africa was appointed to conduct the detailed study for the past fiscal year. The 2016 Economic Impact Report reveals that the Centre has continued to make a massive contribution to both the local and national economies and significantly complement the job creation efforts in KwaZulu-Natal. The gross benefit to the region is the wealth created as a result of the delegates’ expenditure whilst attending the events secured by the Durban ICC. In order to quantify the region’s financial benefit, the expenditure derived from all visitor activity in the relevant economic sectors must be calculated. The report tracks the contribution made in a number of key economic indicators including contribution to KwaZulu-Natal’s Gross Geographic Product, the overall contribution to South Africa’s GDP and the impact this had on job creation. In addition, the study reports on the flow to government taxes, net foreign exchange earnings and the contribution to low-income households. The 2016 report reveals t hat during the past financial year, the Centre contributed R4,265,786,593 to South Africa’s GDP exceeding the target of R3.5-billion by 22%. 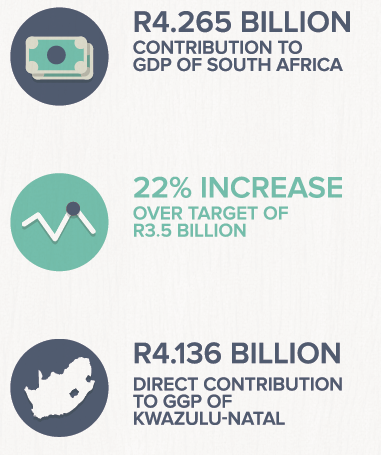 The majority of this contribution directly benefited the KwaZulu-Natal Gross Geographic Product during the year to the tune of R 4,136,602,784. The Durban ICC’s contribution to the country’s Gross Domestic Product over the past decade has exceeded R29-billion, not taking into account its contribution in the first nine years of its operation, which was not quantified at the time. From an employment perspective, a total of 9 976 people were employed as a result of the Durban ICC’s activities. In 2016, 7 367 people were employed directly and a further 2 609 people were employed indirectly as a result of events hosted at the Centre. The total annual payroll for these jobs amounts to R766-million. Viewed cumulatively over the past ten years, the Centre is responsible for creating and sustaining over 82,000 jobs. The report projected that the Centre generated a total of 1 235 204 delegate and visitor days during the 2016 fiscal year. 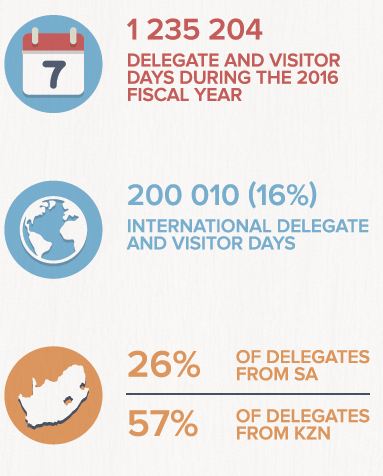 International delegate and visitor days totalled 200 010 and constituted 16% of the total days. The balance of the days was split between delegates from within the KwaZulu-Natal province (57%) and the rest of South Africa (26%). • Tax Revenue Generation – A total of R237.3-million in tax revenue was generated by the Durban ICC in 2016. Since 2007, activities associated with the Durban ICC have cumulatively contributed R2.4-billion to government taxes. • Net Foreign Exchange Earnings – The Durban ICC makes an important contribution to foreign exchange earnings by attracting international delegates and tourists to the country. 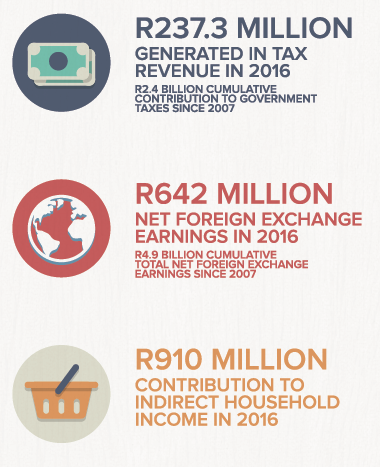 The foreign exchange earnings totalled R 642-million in 2016 and bring the cumulative total of net foreign exchange earnings to R4.9-billion in since 2007. • It is projected that the Durban ICC contributed R910-million to indirect household income in 2016. • Impact on the Tourism Industry – Apart from the foreign exchange revenue mentioned above, the Durban ICC makes a significant contribution to the tourism industry by attracting international delegates to South Africa. It is estimated that an additional 856 731 hotel room-nights were generated as a result of the Centre’s activities in 2016. The main beneficiaries of the additional room-nights spent in the country are the accommodation, food and beverage, and retail sub-sectors.